Get ready for the blockchain gaming revolution! This is no ordinary cryptogame. This is exactly what all games wish they were. Fun, immersive, profitable. 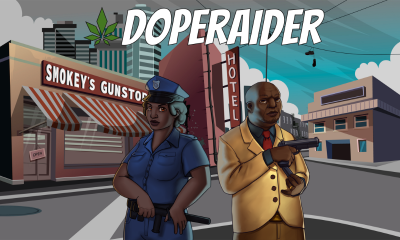 DopeRaider is a multiplayer RPG built completely on the ethereum network, making use of smart contracts. The game is very unique and establishes its very own economy, influenced completely by its players actions. You play this game as a narco, and its your job to hustle weed and coke between districts for a nice profit. If you're not the hustling type, then go ahead and grow your own crop or refine your own powdered goodness. And if that doesn't suit your style, then get out your guns and go raid some other players and steal their stash. Weed and coke can be bought and sold for ETH throughout the districts in the game, with each district having its own micro-economy that influences price. Upgrades can also be purchased to make your narcos more adept at their trade. Whether its a brand new lambo for making speedy get-aways, or a kevlar jacket to protect you from other narcos bullets, it's all there in this fast paced, GTA-style game. Oh and one more thing, always remember... Respect has a price!